I'm Melanie and I was born in Iowa and raised in Illinois. I had the good fortune to meet an Iowa boy at my first (and only) post-college job in Clinton, Iowa, and we've been married for 26 years and have a 16-year-old son. We live in Wisconsin now, but are Iowans at heart. We three bipeds share our home with one dog, five cats and two goldfish--our own little menagerie! I started stitching when I was in college at the University of Illinois, I think sophomore or junior year (it's been so long I can't even remember! ), so right around 30 years ago. My mom had come for the weekend and we were shopping (one of our favorite things to do together) and came across a cross stitch shop; they had a chart of Chief Illiniwek and I just thought it was so cool. My mom bought that and a small kit with two unicorn heads to practice on, and my obsession was born. I started my blog around the beginning of 2012 as a way to try to encourage myself to finish some of the many WIPs I had at that time; I made a list of 20, with the intention of only working on designs I had already started (or at least kitted)--that didn't last very long at all! Of the original 20, only 11 are completed more than five years later. Not long after I started the blog I think I counted 62 WIPs in various stages of completion; it's not an exaggeration to say that I probably have twice that many now. 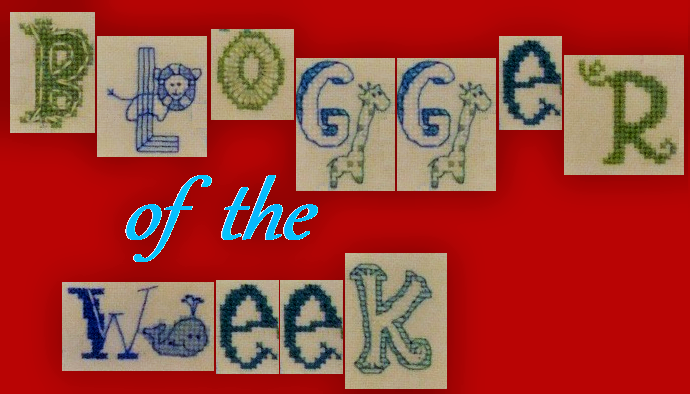 The name I chose for my blog is a fairly obvious reference to the TV series (not the movie!) Buffy the Vampire Slayer, which had a subversive sense of humor that I really enjoyed. As I was trying to "slay" some of my WIPs, the name just seemed to fit. As may be obvious from my previous answer I am a serial starter! There is just something so satisfying about pulling out a pattern and the threads, picking the perfect fabric and putting in those first stitches...I'm seriously addicted to that part of the process. That said I am fairly organized; even with all of the projects and supplies I have I can almost always find what I'm looking for in my craft room pretty quickly (no one else could, but my system works for me!). I recently added some storage, and the bin on the left says exactly how I feel when I'm in my craft room. 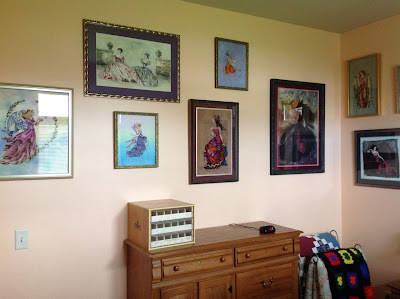 I started stitching models for Karen Kluba of Rosewood Manor about seven years ago now, and that has brought some discipline to my stitching. While there usually isn't a strict deadline, I do try to get the pieces done in a timely manner. Working for Karen has been a dream, as I love to feel like I'm contributing to an industry that has been such a big part of my life, and it has the added bonus of adding to my framed pieces collection--after the models have been out for a while I get them back, already framed. 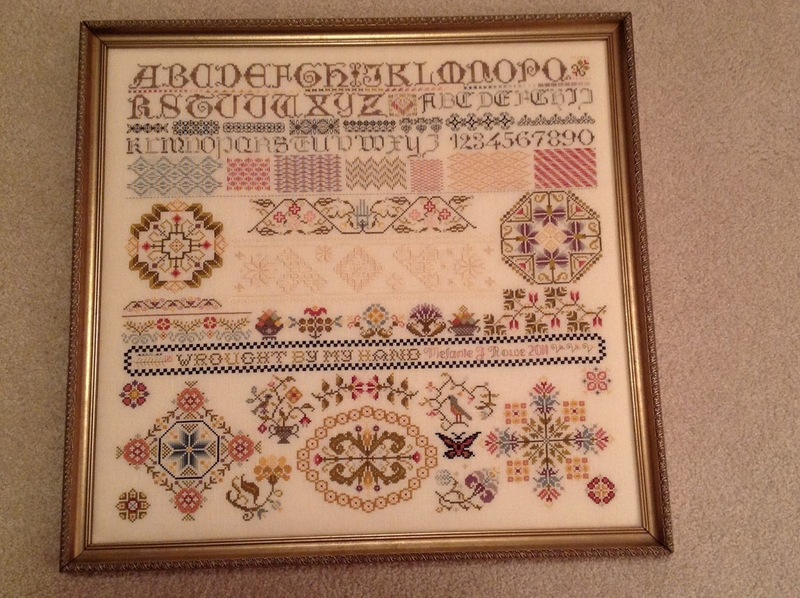 Here are a couple of my favorites, Past & Present and Bucklebury Sampler. 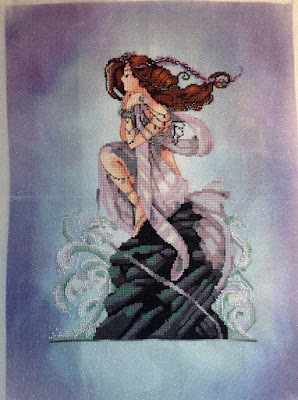 Without a doubt my absolute favorite designer is Nora Corbett of Mirabilia Designs; I have every chart she has ever made, even though I could never live long enough to stitch them all! 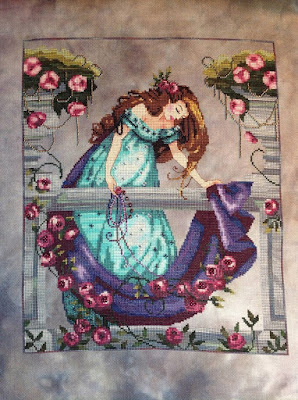 I have loved her work ever since I discovered her patterns back in the '90s; the first one I ever stitched was Villa Mirabilia, and the second was Blooming Bride. Since those I have finished probably 60+, and I never get tired of them; even as a child I was drawn to pictures or movies of beautiful women in gorgeous dresses, and Nora is the best at creating designs along those lines in my humble opinion. 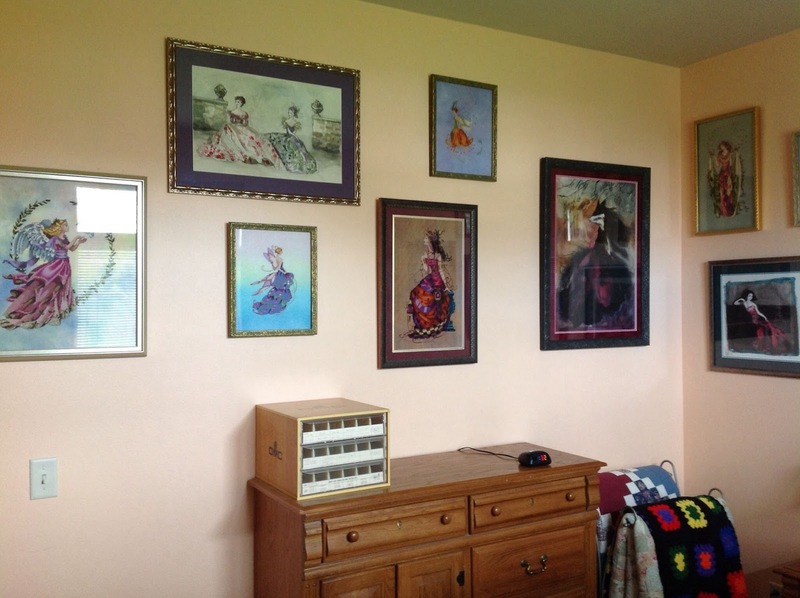 I call my guest bedroom Noraland, because it is the room that a lot of my framed finishes are displayed in, as well as original art by Nora. I have added a few more since these pictues were taken, but you get the idea! Just over a year ago I started stitching the smaller Nora Corbett line of designs for Wichelt, and it's like a dream come true; it almost feels like stealing when I get paid because I stitch so many of these for pleasure. The first two should be released in either September or November, and I am anxiously awaiting that day! I think hand-dyed fabrics are probably the my favorite addition to this craft, followed by the variety of fibers that are out there now; they can add so much to a design! I think I've been lucky, as the only disaster that comes to mind is when I bumped my stitching table and some coffee sloshed out of my mug and landed on the piece I was working on. However, it only caught the unstitched portion of my fabric, and it was a hand-dyed fabric so by the time I rinsed it out you couldn't even tell it had happened. Of course, now that I've said that I'm probably asking for a huge disaster! 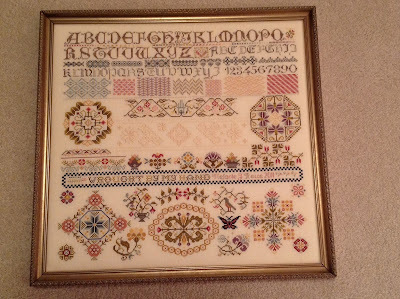 I've always loved the look of Hardanger, but I just can't bring myself to try it--the thought of actually cutting into a piece scares me too much! 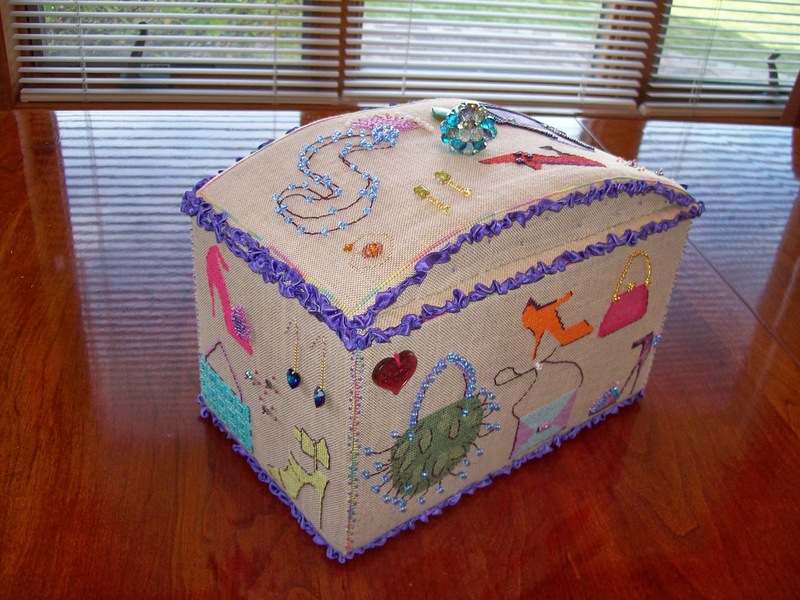 After 30 years of stitching of course I have a box of finishes that need finishing. I tend to do larger designs which would need to be framed, but of course framing can be pretty expensive. My wonderful husband usually gets me gift certificates to the gallery where I have my framing done at least twice a year, so I do have a fairly large numder of finishes hanging around my house; it's actually to the point where I might have to start rotating pieces as I don't have much wall space left! I don't really think of particular projects representing me, as it's more about the process for me. It is still a wonder to me that I can take a piece of fabric and some thread and create an amazing picture with them. 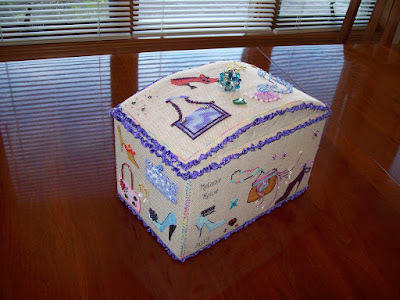 Stitching has gotten me through some tough times--no matter what is going on in my life, I can create one small bit of beauty and order in my world with just a few materials. When I was bored in school I would try to list all 50 states. Eventually I memorized them in alphabetical order, and to this day (almost 40 years later) I can tell you how many states start with each letter of the alphabet, and can name them all in order in less than a minute. So glad to have "met" you Melanie. I am SUPER impressed!! 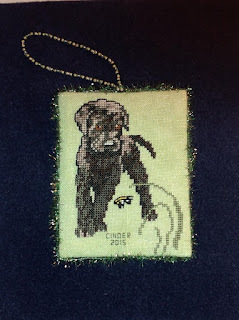 Lovely to read about you and your stitching Melanie.You stitch beaiutiful pieces of work. 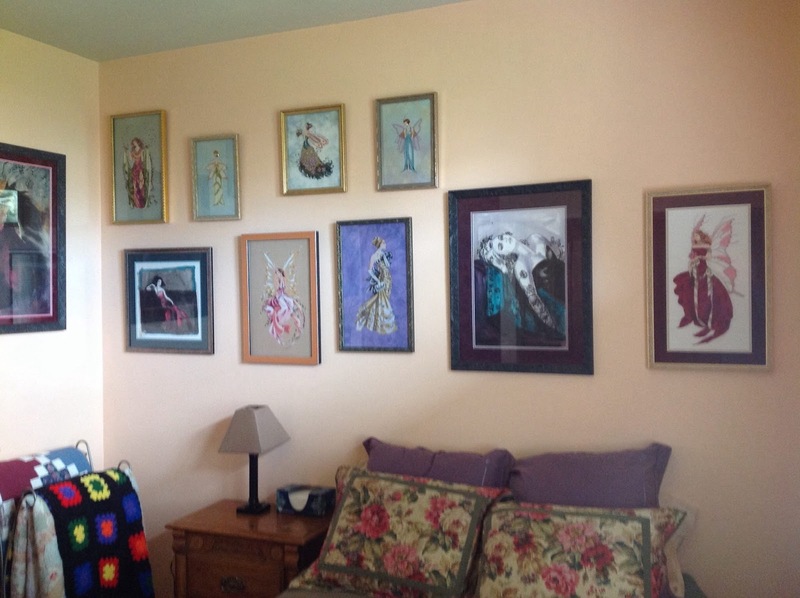 Wow!What a great wall of stitched treasures!I am open mouthed with admiration.Heading to your blog!AriadnefromGreece! WOW such beautiful stitching Melanie! I am truly in awe. I am pleased to meet you. 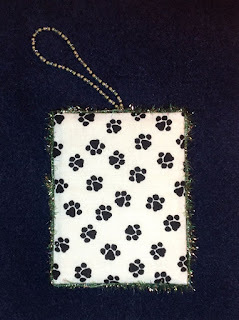 I am from the Chicago area (South Suburbs) and always get excited to see another person from Illinois stitching even though I am now in Tucson. Thanks for allowing us a glimpse into your "Happy Place" also. With that number of WIPs you are a stitcher after my heart, Melanie. I love starting new projects myself sand can understand your feelings very well when you put needle to fabric on a new project. It's so satisfying, isn't it? 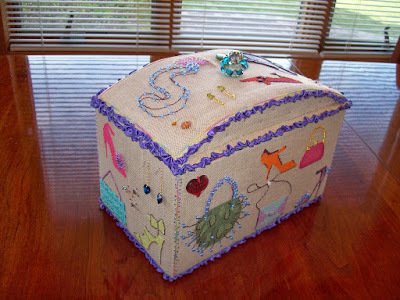 You have stitched some wonderful pieces. I love them all. Wow so many gorgeous pieces. I've done model stitching for Rosewood Manor too several years ago. She is such a nice lady with beautiful designs. Your beautiful room of framed Mira's are just amazing indeed. Great answers! Nice to meet you, such a beautiful collection of pictures you have shared. Lovely to learn more about you Melanie. I think it's really interesting to read how others got started in this hobby of ours. Noraland is beautiful - I'm sure you have guests queuing to stay there! I really like your latest two framed finishes, your framed did a great job. I've just noticed your new Nora deadline was today- I hope you made it! How lucky for you to be stitching models, they look wonderful. And your Norland, just stunning! So much beautiful stitching, thanks for sharing and wonderful to meet you.